Elizabeth Ann Clearman, 71, died November 27, 2008, in an Abilene Hospital. Services will be 2:00 p.m. Saturday November 29, 2008, in Lawn Baptist Church with the Reverends Price Mathieson and Mark Moore officiating. Burial will be in McBee Cemetery, directed by Fry-Bartlett Funeral Home in Tuscola. Visitation will be 6:00 ? 8:00 p.m. today, November 28, 2008, at the funeral home. Ann Clearman was born March 5, 1937, to L. B. and Eva Noland Lookingbill in Summerfield, Texas. She married Jamie Clearman August 20, 1959, in Summerfield. The couple moved from Hereford to Abilene and to Ovalo in 1971. Ann attended Wayland Baptist College in Plainview and West Texas State University in Canyon before graduating from Hardin-Simmons University in Abilene. 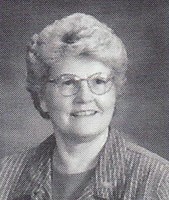 She taught school in Jim Ned Elementary at Buffalo Gap and Lawn campuses, retiring in 1992. She was a member of Texas Teachers Association and Retired Teachers Association. She was a member of Lawn Baptist Church, where she was organist for 35 years. Preceding her in death were her parents; one brother, Bill Lookingbill; and a son, Koby Loys Clearman, December 2, 1972. Survivors include her husband, Jamie Clearman of Ovalo; two sons, Keith Clearman and Gayla and Karley Clearman, all of Lawn; one daughter Kristi Whitehurst and husband, Kelvin of Lawn; five grandchildren, Kaylee and Kade Whitehurst and Ty, Hadley and Klay Clearman; three brothers, Bradley Lookingbill and wife Jeanie of Hale Center, Jim Lookingbill and wife Margaret of Hereford, and Fred Lookingbill and wife Sandy of Summerfield; one sister-in-law, Shara Hamilton and husband Tommy of Friona; several nieces, nephews and cousins; and many friends. The family wishes to express special thanks to those who cared for her and supported her during her 4 ½ year battle with cancer: Dr. Toby Williams, Dr. Mark Reedy and his nurse Shiela; Sandra , Cathy, Heather, Martine and Cindy at Abilene Hematology and Oncology Group; fellow teachers; Dianne Hood and Mindy Stogsdill with Hendrick Hospice Home Care; and many friends, neighbors, and members of Lawn Baptist Church. Memorials may be made to Lawn Baptist Church Building Fund, Lawn, Texas 79530 or Hendrick Hospice Care, 1682 Hickory, Abilene, Texas 79601. I remember Mrs. Clearman fondly. She was my first teacher in the Jim Ned school district. She was a wonderful lady and I am sure she is truly missed.